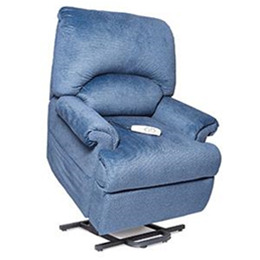 The Specialty Collection from Pride® Power Lift Recliners features the LC-835, a 2-position chaise lounger that offers the comfort and convenience of a lift chair in a space-saving design. The LC-835 has a stylish look and can be placed just five inches from the wall, making it the ultimate lift chair for smaller living spaces. The LC-835 Pride Lift Chair is available in a variety of fabrics including, but not limited to: Deep Sky, Ember, Oat, and Timber.